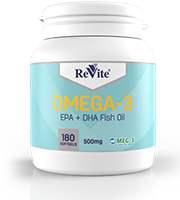 Omega-3 fatty acids from fish oil are polyunsaturated fats EPA & DHA, they are essential because your body can’t produce them. Proven beneficial for heart, brain and eye health. Ideal for Immune boosting & weight control. MEG-3™ fish oil is the ‘gold standard’ in quality. Capsule shell contains bovine gelatin. Heavy metal and impurity free. Natural Vitamin E has been added as an antioxidant.